After investigations by generations of scholars, the case of the prehistoric human adventure in the deserts of North America has emerged as a rich, if largely unresolved, detective story, complete with abundant and often puzzling clues, no living witnesses, and many suspects. Some unknown thousands of years ago, during the last of the great Ice Ages, human beings appeared for the first time in the southwestern United States and northern Mexico. Scattered in small bands across hundreds of thousands of square miles, they followed and hunted big game such as mammoths, mastodons and bison. They lived in shallow caves, rock alcoves and, probably, ephemeral brush and hide shelters. Given their nomadic lives, small band sizes, and infrequent contacts, these early peoples, often called, collectively, the Paleo Indians, somehow managed to maintain a remarkably uniform and unchanging culture through time. Some eight to ten thousand years ago, as the Ice Age drew to a close and many big game species fell into the black hole of extinction, the Desert Archaic Indians, descendents of the Paleo Indians, adapted to the environmental change, the new animal populations and the new plant communities. While they continued to hunt, they turned increasingly to wild plant harvests for food. Slowly, over time, they put the ways of thousands of years behind them, and they began to diversify culturally, developing new environmental adaptations, incorporating larger bands, constructing more durable housing, manufacturing more complex stone tool assemblages, and weaving plant-fiber mats and baskets. Perhaps stimulated by the great Mesoamerican civilizations to their south, the late Desert Archaic Indians began to experiment with village life, semi-subterranean lodges (or, pit houses), rudimentary agriculture, simple ceramics, and even new religious concepts (documented by increasingly elaborate images on stone surfaces). Early in the first millennium, true village farmers began to emerge from their Desert Archaic roots. They built small hamlets of pit houses on escarpments, knolls or mesas overlooking drainages, playa lakes and arable land. Within their hamlets, they often built a larger pit house structure which apparently served, not as a family lodge, but as a community gathering place and ceremonial chamber. They wove intricate mats and baskets. They cached food surpluses against hard times. They adapted the bow and arrow. They produced painted and chiseled symbols on stone, with many of the images embodying the farmer’s concern with rain and water and some others suggesting influences from Mesoamerica. For the first time in the prehistory of the southwestern United States and northern Mexico, people relied more on their crops  primarily corn, beans and squash  than on hunting and gathering. Late in the first millennium, the pit house villagers began give up their pit house structures in favor of contiguous and multistory stone and mortar buildings on the surface of the ground. Over the next several centuries, they evolved, culturally, into the Puebloan people. Their populations increased. They expanded into marginal regions. They planted larger fields and developed complex irrigation systems. They traded turquoise for Mesoamerican macaws, copper bells and marine shells. They became master craftsmen. 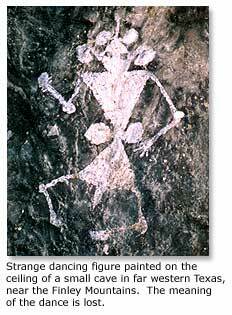 They celebrated rituals in chants and drum beats in semi-subterranean ceremonial chambers, or kivas, and in dance and song in community plazas. In a scenario which started in the 12th century in the Colorado Plateau but played out on different timetables and tempos in different regions, the Puebloans began a prolonged contraction of their range, a concentration of peoples, and a fusion of the major regional traditionsthe Mogollon, the Hohokam, the Anasazi and the Casas Grandes. By the time the Spanish arrived in the 16th century, the Puebloans had substantially abandoned large areas  the Colorado Plateau, southern Arizona and southern New Mexico and northern Chihuahua  and had coalesced in communities in the upper Rio Grande drainage system, west central New Mexico and northeast Arizona. As pit house villages dissolved into the full classic Pueblo communities, other groups  some with continued hunting and gathering roots and others with pit house or Puebloan affinities  lived outside the cultural mainstream. The Yuman peoples, who ranged across the western Sonoran and eastern Mojave Deserts from the 8th into the 16th centuries, practiced some farming but, like the Desert Archaic Indians, relied primarily on hunting and gathering. The Sinagua, probably Yuman descendents, lived in north central Arizona from the 6th through the 15th centuries and drew on pit house, Mogollon, Hohokam and Anasazi traditions to develop a blended Puebloan culture. The Salado people, who occupied east central Arizona’s Tonto Basin from the 12th through the 15th centuries, apparently represented a tossed cultural salad, a product of migrants from the Mogollon, Hohokam and Anasazi. Still other groups, for instance, the Pimas of the northern Sonoran Desert and the Manso and Suma of the northern Chihuahuan Desert, lived in hamlets and raised small garden plots of corn, beans and squash, much like the pit house villagers of the first millennium, or they lived as nomads, hunting and gathering much like Desert Archaic Indians 5000 years ago. The mystifying Trincheras people, who lived on the flanks of rocky terraces in the northern Sonoran Desert and the northwestern Chihuahuan desert apparently for some thousands of years, occupied adobe or rock-wall lodges and farmed nearby fields, but without clearly defined relationships with pit house or Puebloan traditions, they seem to have traced their own cultural orbit. The widely dispersed and diversified Jumano Indians, who emerged as an identifiable culture early in the second millennium, lived as peripheral Puebloans in the Chihuahuan Desert, along the Rio Grande from El Paso to the Big Bend, and they apparently ranged as hunters, gatherers and itinerant traders  prehistoric and historic gypsies of the desert  from north central Arizona to far eastern Texas. Sometime during the first half of the second millennium, Athabaskan-speaking peoples  the Navajos and Apaches  filtered from the northwest into the arid lands of North America. The Navajos found their cultural niche as semi-nomadic herdsmen in the southern Colorado Plateau, which the Puebloan people had long since abandoned. The Apaches carved out their place as nomadic hunters and gatherers and, until the late 19th century, notorious raiders across New Mexico, western Texas, northern Chihuahua, northeastern Sonora and southeastern Arizona. The Utes, from Colorado, and the Kiowa and Comanches, from western Oklahoma and the Texas Panhandle, preyed mercilessly on the desert Indians and Euroamerican settlers until late in the 19th century. Over the thousands of years, the cast of characters  the Paleo, the Desert Archaic, the pit house dwellers, the Puebloans, the marginal tribes, the Athabaskan speakers and the outside raiders  of the prehistoric deserts of North America left behind them a long trail of tantalizing clues and bewildering mysteries. When did human beings first appear in the deserts of North America? Who were they? Where did they come from? How did they get here? Legendary archaeologist R. S. "Scotty" MacNeish believed that, in the early 1990’s, he found evidence for human presence some 50,000 years ago at his Pendejo Cave archaeological site, in south central New Mexico. That is tens of thousands of years earlier than the traditionally accepted dates for the arrival of humans in the Americas. It is, in fact, thousands of years earlier than the extinction of the Neanderthals or the arrival of modern man in Europe. As MacNeish anticipated, his work has drawn fierce criticism. Traditionalists insist that most of the evidence, for instance, a cluster of dates established for Paleo Indian artifacts and skeletal material, argues for an arrival of perhaps no more than 9000 to 15,000 years ago, during the latter stages of the last Ice Age. Archaeologists believe that Paleo Indians produced the famous Clovis spear points, first discovered in 1929 near Clovis, New Mexico, some 11,000 years ago. They think the Paleo people produced the equally famous Folsom points, first found around 1927 near Folsom, New Mexico, about 10,000 years ago. Scientists believe that Midland Man  actually the skeletal remains of a woman found on Monahans Draw a few miles south of Midland, Texas  lived about 10,800 to 12,400 years ago, according to Valentina L. Martinez in her paper "Midland Site," The Handbook of Texas Online. Researchers believe, according to Karen Wright’s article "First Americans," Discover Magazine, February, 1999, that Spirit Cave Man, found in a rock shelter near Carson City, Nevada, lived about 9400 years ago. Wizard Beach Man, found 100 miles northwest of Spirit Cave Man’s rock shelter site, lived 9200 years ago. Buhl Woman, found in Idaho, lived 10,700 years ago. Kennewick Man, discovered at the confluence of the Columbia and Snake Rivers near Kennewick, Washington, lived approximately 9,400 years ago. 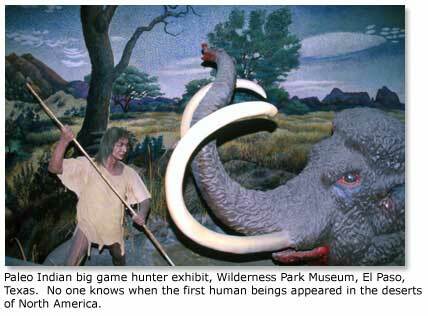 Based on early discoveries, archaeologists "?thought the first humans in the New World were mammoth hunters from Siberia who crossed the Bering Strait at the end of the Ice Age," said Wright. In more recent investigations, however, one scientist, Theodore Schurr, "calculated that 20,000 to 40,000 years had elapsed since new-world and old-world groups shared a common ancestor," said Wright. Researchers contend that the Meadowcroft rock shelter site in Pennsylvania, clear across the North American continent from the Bering Strait, is 17,000 years old and that the Pedra Furada cave site in Brazil, a continent and a half beyond the Bering Strait, is 32,000 years old. Archaeologist Torn Dillehay thinks he may have found evidence for human occupation more than 30,000 years old near the famed Monte Verde site, 10,000 miles south of the Bering Strait, in southern Chile. As a result of the more recent discoveries, researchers are investigating the possibility that the first Americans arrived, not as hunters traveling by land across the Bering Strait, but as fishermen traveling by hide boat along continental shorelines, both from Asia and even from Europe. (Some of the early American skulls have characteristics which are more European than Asian.) In an article by James M. Chandler, "The Baja Connection" in the Center for the Study of the First Americans’ Mammoth Trumpet, Smithsonian archaeologist Dennis Stanford said in a quote that "everyone knows that boats have been around for 50,000 years." That might help explain the great range of early man’s occupations in the Americas. Although Scotty MacNeish’s dates for the human occupation of Pendejo Cave seem more reasonable in light of recent work, the arrival times, identities, origins and migration routes for the first human beings to appear in the deserts of North America remain a mystery. What effects did Mesoamerican contacts have on Puebloan cultural development? Some archaeologists believe that influences from Mesoamerica, probably conveyed in the form of ideas and goods by itinerant traders or possibly by long-distance trader/missionaries, lay like a cultural skein over the history of the Puebloans and their ancestors. Others suspect that those influences, while undeniable, moved more like localized and transitory currents through the history, with relatively little lasting effect. At one end of the spectrum have stood researchers like Kay Sutherland, who thought, for example, that the most fundamental Puebloan religious beliefs owed a heavy debt to Mesoamerican influences. In her paper "Spirits from the South," published in the El Paso Archaeological Society’s journal The Artifact, Sutherland said that, "The Puebloan cosmovision bears numerous similarities to the Mesoamerican cosmovision. In both, for instance, the origin myths are similar. The number four is significant. The cardinal directions are associated with colors, mountains and animals. There is a concept of a Mother creator, a concept of binary oppositions (e.g., the Hero Twins, the twin war gods, the Flute Boy and Girl, the Snake Boy and Girl). There are many other examples." At the other end of the spectrum stand much more provincial investigators. As Michael S. Foster pointed out in his paper "The Mesoamerican Connection: A View From the South," published in The Chichimec Sea, "In most instances southwestern archaeologists tend towards an isolationist view, rejecting the proposition that mesoamerican [sic] cultural developments influenced the development of southwestern society." Although some archaeologists have studied the interaction between the peoples, their "conclusions have been generally unchanged: mesoamerican cultures had little if any influence on the development and character of southwestern societies." It is inescapable, however, that on the surfaces of stone, ceramics and ceremonial chamber walls across the desert, we find images of icons and designs which appear to have Mesoamerican roots, including, most famously: the horned serpent figure, apparently derived from the Mesoamerican plumed serpent, an icon for the Quetzalcoatl deity; goggle-eyed, snarling-mouth masks, possible a descendant from the Mesoamerican Tlaloc figure, the storm deity; collared jaguars, purportedly an icon for a Mesoamerican priest clan; and step-fret and step-sided pyramidal designs, which resemble Mesoamerican motifs. In Hohokam and Casas Grandes Puebloan ruins, we find ceremonial platform mounds and sunken ball courts much like those in the Mesoamerican region. At Chaco Canyon ruins, we find architectural features such as colonnades and support post seating disks which have apparent counterparts in Mesoamerica. At many Puebloan sites, we find macaw and parrot remains, shell trumpets, copper bells (or "tinklers") and other trade goods which originated in Mesoamerica. Perhaps most importantly, we know that corn, the paramount crop of the Puebloan farmers, had its origins in Mesoamerica. 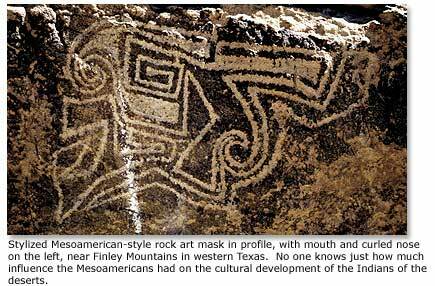 Those who hold to the view that Mesoamerica had a strong influence on the Indians of the desert "have emphasized the occurrence of Mexican items, technology, and iconographic symbols in the Southwest as evidence for a mesoamerican presence in the Southwest," said Foster. "These traits not only represent tangible bits of material culture but also elements in a belief system." By contrast, those who discount Mesoamerican influences think that the relatively low abundance of Mesoamerican trade goods and the inexact similarities in ritual and icons make it "reasonable to assume that local southwestern leadership depended far more heavily upon ‘local’ symbols of authority and status than on rare mesoamerican items," according to Foster. Although archaeologists agree that Mesoamericans left their fingerprints in the deserts of North America, we have no consensus on the full effects that contacts may have had on the cultural development of the Puebloans. 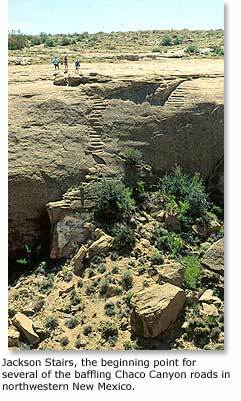 What purpose did the prehistoric roads of Chaco Canyon serve? Among the most baffling cultural features of the prehistoric American deserts are the road systems of the Chaco Canyon Anasazi, who had no wheeled cargo vehicles and draft animals or even pack animals to use the roads. In their book Chaco Canyon, Robert H. and Florence C. Lister said that the roads "could have had several functions, namely to provide well-defined routes for the travel of groups and individuals within the Chaco sphere and between nearby community centers, to transport raw materials into Chaco Canyon and goods and materials among those affiliated towns, to facilitate communication between widely separated groups, and as a means for keeping the Chacoans together as a cohesive social force. No other aboriginal land communication system of such magnitude and purpose has been recognized north of Mexico." Navajos told Marietta Wetherill, wife of famous early archaeologist Richard Wetherill, that the roadways were actually "race courses." In accounts referred to by Linda Cordell in Archaeology of the Southwest, Navajos said that they believed that the roads had served as transportation arteries for construction timbers. Renowned archaeologist Neil Judd thought the roads were "ceremonial highways." John R. Stein and Andrew P. Fowler called them "earthen umbilicals," which connected outlying communities to Chaco Canyon. By any interpretation, the Chacoan Anasazi left few artifacts along the roadways to signify the functions or even to mark the passages. According to John Kantner in his paper "Chaco Roads," which he presented at the conference "Evaluating Models of Chaco" in 1997, the system consists of two types of roads. The first includes several long arteries  up to 30 miles in length  which radiate outward in a series of aligned segments from Chaco Canyon to outlying areas. The second type comprises several dozen short segments  typically one and a half to two and a half miles in length  which extended from major Chacoan pueblo structures to "springs, shrines, or other local features." The Chacoan people built the roads up to 30 feet wide near major structures and some six to eight feet wide in remote areas. Along some segments, they built earthen berms or masonry structures along the shoulders. They constructed multiple room buildings, small stone structures and arc-shaped "signaling stations," perhaps something analogous to the roadside parks, motels, gasoline stations and eateries beside modern highways. In some instances  and for no apparent reason  they built several straight and perfectly parallel road segments. Investigator S. J. Holsinger "recorded the existence of an ancient roadway connecting Chetro Ketl [a ruin on the north side of Chaco Canyon] and Pueblo Alto [a ruin just to the north of Chaco Canyon]," said the Listers. The road "is described as being twenty feet wide, walled up to grade with loose rock, and filled with soil. He traced the feature from the top of the Chetro Ketl stairway, thence westward along a narrow terrace paralleling the canyon for about one-half mile to a sandstone ledge where there were indistinct remains of a broad flight of twenty steps cut in the rock. The road then followed a groove cut for several hundred feet in a flat rock outcropping, crossed a wash, and continued north to Pueblo Alto." Holsinger’s road still remains perfectly visible to this day. Alerted by the roads at Chaco Canyon, archaeologists have found other, similar road segments within the four corners region and as well as in other areas, but they still do not understand why the Puebloans spent the monumental effort required to construct the systems. "Certainly," said the Listers, the Chaco Canyon system "was a product of group organization, controls, and a lot of human energy." What underlay the Puebloan contraction, population concentrations and cultural fusion in the first half of the second millennium? In the archaeological record, we can see that Puebloan populations in different regions of desert followed similar, although unsynchronized, patterns of expansion, contraction, concentration and cultural fusion during the first half of the second millennium. Archaeologists suggest that pueblo communities, which typically lasted no more than several decades to a few centuries, may have moved because of the effects of drought, failure of springs and streams, depletion of resources, exhaustion of arable soil, ravages of epidemics, the threat of internecine violence, warfare with neighboring communities, assault by invaders, collapse of leadership, decline of political systems, loss of religious faith, the fear of witchcraft, some combination of factors, or simply the promise of greener spiritual and material pastures. In spite of clues which hint at stresses in the environment, escalation in violence and searches for renewal, investigators have not yet been able to reconstruct a scenario which fully accounts for the widespread abandonments of territory, the consolidations of peoples, and the merging or, sometimes, the subsuming of Puebloan traditions. It was the blend of Puebloan cultures which the Spaniards found in 100 pueblos scattered across the upper Rio Grande drainage, west central New Mexico, and east central and northeast Arizona when they arrived in the deserts of North American in the 16th century. There is a lengthy list of other riddles of the prehistoric desert, but some of the most intriguing revolve around corn, ceramics, strange icons, Mesoamerican trade, the Trinchera peoples and the Athabaskan arrivals. Corn  or maize  first appeared in the deserts of North America as much as 4000 years ago, conveyed to the region by unknown hands over an unknown route to an unknown location. Developed by early Mesoamericans from a grass called teosinte in the plateau region of central Mexico some 5000 to 6000 years ago, corn would fuel the profound cultural transition from nomadic Desert Archaic hunting and gathering to settled Puebloan villages and farming. As important as it was to the transformation of a people, the story of the introduction of corn into the southwestern United States and northern Mexico may never be known. Ceramics, or pottery, almost certainly introduced from Mexico, appeared in the deserts through unknown circumstances over 2000 years ago, either as a item of trade or as a product of an acquired skill. Over time, pots would not only replace baskets for ordinary carriage, transportation and food preparation, they would become clay and canvas for the ceramic artist, a signature and time-marker for a culture, an instrument and icon for ritual, the currency of trade. Although it signaled the establishment of village life and agriculture, the record of the earliest pottery in the desert may be forever lost. On surfaces of stone, pottery and ceremonial chamber walls across the desert, a bewildering galaxy of images of human figures, celebrations, historical events, deities, animals, birds, reptiles, insects, mythological creatures and geometric designs suggests a religious universe with roots no less ancient or complex than that of Judaism, Christianity, Islam, Buddhism or Hinduism. The symbols seem to represent a spiritual passageway for shamanistic entry into a spectral world of vision and ritual in quests for tribal and individual prosperity, health, ancestral connections and remembrance. Unfortunately, the beliefs and ceremonies which gave rise to the images leave no traces in the archaeological records. They are now a lost chapter in the prehistory of the desert. As Marc Thompson, Director of the Wilderness Park Museum in El Paso, Texas, has pointed out, the exchange of goods between the peoples from Mesoamerica and those from the desert seems disproportionate and, in fact, inexplicable. From the archaeological record, it appears that Mesoamerican traders exchanged significant numbers of macaws, copper bells and marine shells  certainly highly valued items  for minimal amounts of turquoise, a "poor man’s jade," says Thompson. He asks, "What were the Mesoamericans getting out of the deal?" The Trincheras left what are some of the most substantial but least understood ruins in our entire desert region. For perhaps 20 centuries or more, until late prehistoric times, they lived in stone and adobe dwellings on massively terraced slopes of hills and mesas across the northwestern Chihuahuan Desert and the northern Sonoran Desert, and they farmed nearby fields. Their archaeological record has revealed little about their origins, their cultural affiliations, their regional interactions, their beliefs, their economy, their concerns or their ultimate fate. In short, we don’t know where they came from. We don’t know why they did what they did. We don’t know where they went. The Trincheras seem to be an anomaly on the archaeological landscape. The Athabaskan-speaking peoples  the Navajos and Apaches  evidently appeared in the desert region sometime in the first half of the second millennium, although some archaeologists believe that the arrival may have been later, possibly during early Spanish colonial times, and based on their oral histories, Navajos and Apaches believe it occurred earlier, long before the Europeans arrived. The Navajos and Apaches clearly had cultural and linguistic roots in the Northwest, where Native American peoples still speak Athabaskan languages. The archaeological data recovered so far don’t tell us when, or why, ancestral Athabaskan-speaking people migrated from traditional ranges to the deserts; what routes they followed; whether they arrived as an intermittent trickle of small bands or in waves of immigrants. We have lost whole chapters of their pre-history. As archaeologists and other investigators dig and sift through the mute remnants of the Native American peoples of the deserts of North America, they often turn up more questions than answers. Do human bones which appear to have been cooked in pots suggest cannibalism among the Puebloans? Do structures which appear to have been ritually burned suggest witchcraft among the Puebloans? Why did the Mesa Verde Anasazi choose to move their communities from mesa tops to canyon alcoves? Why did the Hovenweep Anasazi build towers on the floors of canyons? Why did the Mogollon people suddenly abandon large areas of the northern Chihuahuan Desert, just as their populations climaxed? Researchers look to the past to explain the present. They try to understand the prehistory and history of the long procession of peoples who have crossed the deserts of North America. Most of all, they try to solve that greatest mystery of allthe human species.